A Curatorial Assistant works full-time in an art museum's curatorial department, assisting the Chief and/or Associate Curator with collection research and exhibition preparation. It is mandatory for a Curatorial Assistant to have an M.A. degree in art history. Additionally, having knowledge and experience in standard museum and curatorial practices, and understanding how the art world (of art institutions, galleries, artists, curators, auction houses) operates is needed. In some situations, a Curatorial Assistant will be required to have a valid driver's license, along with a clean driving record. A Curatorial Assistant provides support to curatorial projects initiated within the department. This includes gathering and analyzing art historical and scholarly texts, visual and object location information, and budgetary data, compiled in order to initiate and implement exhibitions. 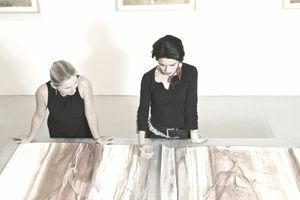 Duties include coordinating and corresponding with artists, dealers, lenders, art institutions, and collectors, preparing loan forms and master checklists, updating and keeping accurate records, scheduling the exhibition calendar and travel itineraries, and assisting with exhibition layout plans and ​installation maquettes. For touring exhibitions, a Curatorial Assistant maintains the database, tracks responses, and consults with registrars, curators, and exhibition coordinators at each venue, helping to record all aspects of the exhibition while it is touring. A Curatorial Assistant helps with the writing, editing, and researching of museum exhibition invitations, artist invite packages, catalog publications, biographic and bibliographic material, wall labels, press releases, and exhibition fact sheets. For publication, a Curatorial Assistant procures the visual images, captions, credit lines and rights for printing and publication purposes. A Curatorial Assistant is a highly skilled communicator, in both oral presentation and the written word as preparing, writing, and editing curatorial texts are a major part of the job. Besides communication, meticulousness, accurateness, meeting deadlines, and multi-tasking are key skills. A Curatorial Assistant is a team player, as working smoothly and effectively with a wide range of arts professionals, museum trustees and staff, artists and the general public, is necessary. Skills also include basic computer office knowledge such as Word, Excel, Filemaker, Google Drive, the museum’s database and project management systems. A Curatorial Assistant typically needs to have some curatorial experience in an art institution, before being considered for a position in a large art museum. Many art museums post job listings for Curatorial Assistants. Qualified applicants are usually asked to email their cover letters and resumes to the museum's Human Resources Department.